So we've changed our plans for the summer. When we left Florida, our loose plan was to head back north for summer/hurricane season and cruise the east coast of the U.S. [Both for insurance and safety reasons we need to be out of the central part of the Caribbean from about June to November.] At some point after we left Jacksonville, we started to consider other options, including staying south in Grenada and/or Trinidad (both places are far enough south that they are typically "safe" during hurricane season). We mulled over the decision for many weeks - we really liked the idea of being in the states so that we could visit relatives and so that friends could more easily come visit us. And we thought the idea of sailing into New York harbor sounded just grand. 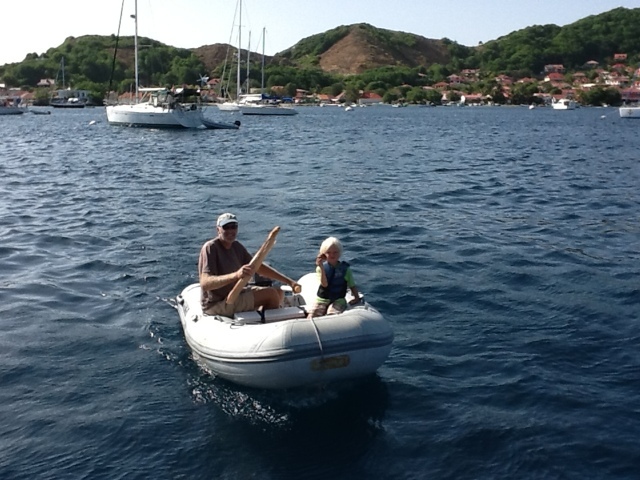 But the further south we traveled, the more we felt drawn to Grenada. Partly we didn't want to "give up" the hard fought ground we'd gained heading south. Spending summer outside of the US also sounded exciting. But more importantly, we felt like going to Grenada would be more in line with our evolving ideas about our goals out here. By goals, I really mean something more like our mission statement (but mission statement sounds pretty dorky for a sailing trip). We set out on this trip knowing that, with kids along, it would be different from our honeymoon sailing trip. But what we didn't appreciate (I've mentioned this before, I think) is how hard it is to travel on land with our kids. We're lacking several key modern conveniences our here, like a car. So traveling by land involves a dinghy trip to shore, plus some walking and, typically, public transport or a taxi. So just GETTING our kids TO the thing we want to see, while keeping their spirits up, can be something of a challenge. And then once we're at the thing we want to see, unless a playground and ice cream are the center of the trip, it's highly unlikely that they will be interested. All of that's compounded by the fact that it's quite hot down here right now. Since land travel can be challenging, we had to really rethink what we want out of this trip, and it comes down to (1) spending time together as a family (2) enjoying the experience of traveling by sailboat and (3) enjoying the community of sailors we are meeting along the way. It was #3 that really tipped the balance to Grenada, as there is a large community of sailors who live there, particularly during hurricane season. It's apparently a really enjoyable and beautiful island and there are lots of organized activities to choose from every day. And some years there are a fair number of kids on boats there, too. The other news about our travel plans is that Grenada is brutally hot in the summer, so we've decided to fly back to Seattle to cool off and visit friends in July and August. We’ll then come back to the boat for the balance of hurricane season before deciding which way to go next November. The plan is still to head to Panama and then across the Pacific, but we're not yet sure exactly what path we'll take to get there. As for right now, we are currently in Portsmouth, Dominica. We are making good progress and feel somewhat amazed that we've traveled from Jacksonville, Florida to Dominica. (Granted, it took us over 5 months. Diana Nyad probably could have swum that distance more quickly.) We are enjoying the relatively diverse culture of the eastern Caribbean, but as we'd been warned, it can be pretty expensive to do much on land. We have, however, grown to love the inexpensive baguettes, cheese and wine that can be found in the French islands. Martinique (a French island) is our next island, and we are already looking forward to morning baguettes. We should be in Martinique by Sunday based on the current weather forecast. But right now it's raining so we're letting the kids watch a show on the iPad, which they were thrilled about. A picture is below. That’s the report from Blue Kai. Over and out for now. Danny and Rye bringing warm baguettes and pain au chocolate back to the boat. Will write more while we are here. We are on an island just south of Guadeloupe and it is incredibly quaint. breeze and the food is amazing. ashore each morning for less than a dollar.